The copperhead snake has a distinctive hourglass pattern on its back that makes it easily recognizable. The snakes live in a large portion of the U.S. ranging from Massachusetts to the east and Nebraska to the west. Although a bite from a poisonous copperhead is painful and might make you sick, a copperhead bite usually isn’t fatal. Copperheads range in length from 24 to 40 inches, with the female being larger than the male. The snake takes its name from the copper color of its triangular head. 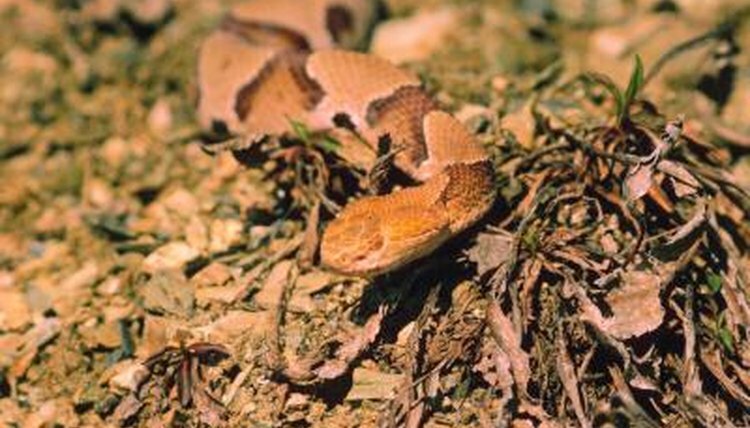 The copperhead’s body is light brown or tan and is covered in dark brown hourglass patterns. The snake’s mottled appearance helps it blend in with leaves and other vegetation on the forest floor. Two small organs called pits, located between the eyes and the nostrils, act as heat sensors and allow the snake to identify prey and predators based on the heat they produce. Copperheads live in a variety of habitats, including rocky hills, forests, wetlands and on the edges of swamps. These habitats also are home to the lizards, mice, birds and insects -- the staples of the snake’s diet. The copperhead has little trouble adapting to other habitats and can be found around suburban areas and in piles of sawdust, mulch or wood. The Animal Diversity website notes that copperheads enjoy the company of other snakes and might even share their dens with black rat snakes and timber rattlesnakes during the winter. Copperheads mate in both the spring and fall. Female copperheads have live births, and baby snakes arrive three to nine months after mating. If a female mates in the fall, she might store the sperm while she hibernates during the winter. Baby snakes develop inside eggs that the female stores in her body. The average number of baby snakes in a brood ranges from two to 14. At birth, copperhead snakes are less than a foot in length and have yellow-tipped tails. The young snakes become sexually mature at about four years old and live an average of 18 years. Copperheads use their fangs to inject venom into prey. Although their mouths look small, flexible jaws allows the snakes to easily swallow birds or mice whole. Copperheads usually avoid people but will bite if they are disturbed. A copperhead bite is painful and requires medical attention. If you’re bitten by a copperhead, you might notice that the bite site swells and looks bruised. Swelling can extend beyond the bite site on the arm or leg. Other symptoms can include nausea, abdominal cramps, vomiting, chills and numbness and tingling in the face, scalp and mouth. Prompt treatment with anti-venom can prevent or reduce tissue death in the affected limb. The emergency room doctor also might give you morphine for pain control and medication to reduce nausea and vomiting. Which State Has the Most Poisonous Reptile Species? What Do Garter Snake Eggs Look Like? How Many Different Types of Venomous Snakes Are There? What Kind of Snake is Green with a Red Belly?